Gel nails are an established thing. But who wants to go to a salon every two weeks (also, who wears one color for two weeks?!) to get their nails done? Apparently not many folks, because a thousand brands came out with at-home gel systems over the last few years. The kits can be pricey though, since you need special polish, toppers, tools, and a light to cure it all. 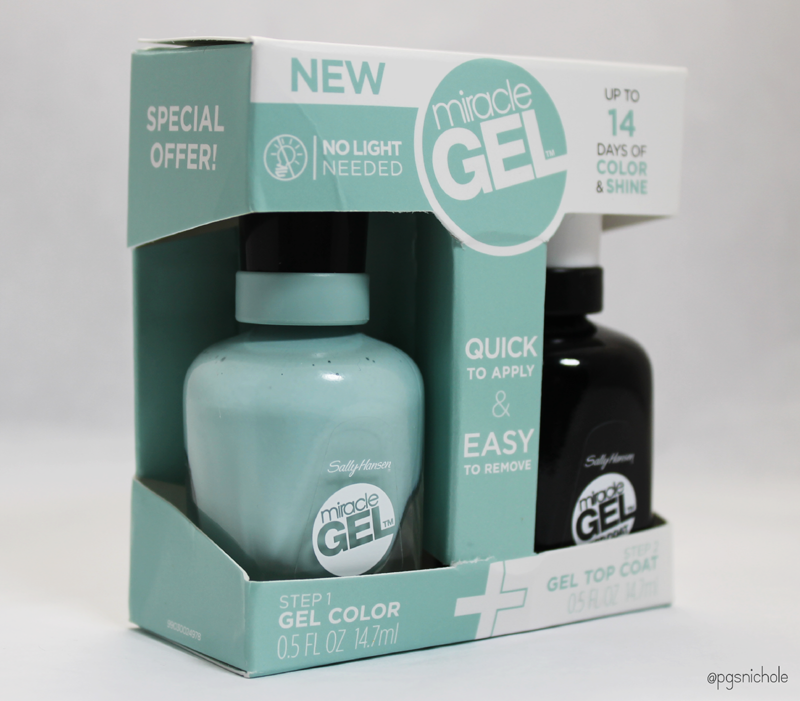 To answer that, Sally Hansen has come out with a no-light gel system. I decided, since I was going on a long family vacation, that this was a perfect opportunity to test them out! My vacation was going to be cross-country for 11 days. I did not want to have to drag nail supplies (beyond a nail file and hand lotion) or polish on the plane. I had $5 in CVS extrabucks, and this set was $15.99...so I figured it was a sign and grabbed B Girl, a lovely minty blue color. freshly applied. HOWEVER, this is not the "before"
picture. I am an idiot and forgot to take pics. did I mention this was my "meeting Amanda" mani? The instructions say "no base", so I didn't use one. They also said "two coats" but I laughed at that and applied three. Two coats left me with streaks and sadness. This particular shade was, for me, far too thin at two coats to be wearable. I can't abide streaks, so I added another coat. The polish itself doesn't feel very self leveling, but that could be just this color in particular. You definitely need a thick topper to smooth over the troughs. I guess this stuff did well? I mean, it was still on my nails after thirteen days...for the most part. I only had one big chip on my right hand, and that was because I caught my fingernail on my suitcase and tore the polish (but not my nail. Woooo!). I didn't have any trouble with lifting or peeling either, which I sometimes do with polishes that are thicker. I didn't have much visible wear at all until about six days in, when it seemed to start wearing away at my tips. Have you ever worn the Sally Hansen Color Foils? You know how they kinda buff off a bit after a day or two? These kinda did that to me. I'm not delicate or careful with my nails though. There was a ridiculous amount of hand washing, swimming (salt water pools are awesome), and sun screen application over these thirteen days. I'm unsure if it was user error, or if this polish has some major dulling. It was definitely a demi-matte (very close to some neon polish finishes) by the time I took it off. That was a major bummer for me, because I like shiny things. This stuff was almost too easy to remove with acetone remover. I gave myself a pedicure after applying this, and ended up having to re-do the first three fingers of both hands because the polish wore right off. Generally when I remove my polish, I will saturate a cotton ball in remover, and place it on my nail for 30-90 seconds, depending on the type of polish I've got on there and how many layers. Most polishes remove easily in one swipe using this method. I expected, because this is a gel-ish sort of concoction, that I would need a longer soak. This was most definitely not the case. It removed as easily as any regular polish, if not easier. There is no foil/scrubbing required for this stuff. It seems ok. I don't think it wears all that much better than normal nail polish that has been carefully applied. I think if you are going on vacation and can't be bothered to polish, then it is a fabulous option. I'm not sure it would really dazzle if you had a special occasion during that time though. I'm not throwing it out, but it may be my last bottle. I have been debating on whether or not to purchase this. I am an avid hand washer, so if I can get through the day with tip wear, I am good to go. same here. With wee kids in the house, you know I'm washing or hand-sanitizing constantly. I haven't tried this topcoat, but I've used the Vinelux one and the Revlon one (both from color + topcoat, no base coat and no light type systems). I love them over regular polish; very glossy and long lasting! I have heard that sunscreen can affect the finish of polish - that's my guess for the reason yours dulled, though of course I can't know for sure! I didn't know that about sunscreen, but it makes sense. We used a lot of spray-on sunscreen (easier to coat the kids) and I bet the propellants weren't doing and favors. I like the topcoat for glitter. It's like Gelous and SV had a baby. Wow. I tried three colors and all of them looked shabby after only 3–4 days and the topcoat left brush marks. It lasted better just using it as a regular polish with base coat and Seche Vite! thats weird, what colors were you using? And I agree, I'm not sure the polishes are all that different from the average polish. Robin try the top coat over regular polish. It might really work for you. Nichole, I can't wait to hear what you think about this over regular polish. I tried it over Essie In The Cab-ana for a week, and it is just barely showing minor tip wear. I even made homemade fried chicken, and had to use my nail brush a bunch of times ( I am totally a messy cook LOL)! I am so impressed with the topcoat. And very glad I bought it. my thumb grows fast, and its harder than most of my nails...so I just let it go. Thats why you rarely see it on the blog. It is conspicuously longer than the rest! This is a great color! I haven't gotten into gel nail polishes because I'm always switching up my nail colors. I dont think I could do actual gel, because I don't wear polish for this long normally. If I wasn't on vacation, I doubt I would have made it 13 days!